Harmony and its opposite, the kludge, are fundamental to good game design. Games that lack harmony or have in-harmonious aspects have a handicap, though some succeed. Fortunately, most of the in-harmonious games are never published, or only self published. Players don't always recognize the in-harmony but its existence still affects the game. Designers may not recognize in-harmony if they think of the game as “My Baby.” But designers need to recognize it and get it out of the game. I think Moriarty moves into the touchy-feely as he goes on, but you can look it up and see what he has to say. I'm using a simpler definition: “everything in the game feels as though it belongs there and contributes to the purpose and feeling of the game as a whole.” That's harmony. It's important because games are not just collections of mechanics. Not just data. Not just metrics. Games make intellectual and emotional impressions on players, and lack of harmony is noticeable, sometimes clearly, sometimes in subtle ways. The effect is not good for the intellectual and emotional impression. Harmony is not the same thing as “elegance,” in fact I hesitate to use the word elegance because it's used by fans of certain kinds of tabletop games as a bludgeon to attack fans of other kinds tabletop games, who in turn react very negatively to the word. ”Elegant” is often used in much the same sense as “clever.” It's usually used in relation to abstract games or practically abstract games, games that are not models of some reality. Harmony isn't cleverness, it’s something that affects the game as a whole. It's about appropriate fit. Now what's appropriate fit depends on what standards people are using, and those standards have changed and very much loosened over the years. Think about movies and TV shows over the years. What makes sense? The screen has always required a heavy “suspension of disbelief”, but those entertainments have consistently become less believable. People will accept all kinds of foolishness and huge plot-holes because the program is otherwise entertaining. and we’re getting the same thing in games. I still have SOME standards even for movies. The Starship Troopers movie (monsters in outer space) had us travel 80,000 light years and then forget that we can use tanks or helicopters! Monsters farted unguided missiles, yet the human fleet stayed tightly packed together in space to make itself a good target! It's just ludicrous. Yet it was a popular movie that begetted a couple sequels. The same kind of loosening of standards of disbelief has happened in game design. People often treat games more as time killers or something mildly engaging to do while they socialize, than as actual entertainment or something worth *focusing* on. So they let things go by that would not have been accepted many years ago. All right. What's the opposite of harmony? The Kludge. I borrow this term from software (“kludgy” is the adjective that's used.) A kludge is a tacked-on solution to a particular problem, or a solution that works but isn’t consistent with the rest of the program. In software though not in games it's also hard to understand and modify. The Kludge is hard to define in game design because one man's kludge is another man's “nothing wrong with that.” How do you notice the kludges if the game is a model of something? The kludge will usually be inconsistent with the rest of the model, and may have nothing at all to do with what's being modeled. It may be there to fix some design flaw. When I play games I sometimes ask, why am I doing this particular thing? If the only answer I can find is “because it fixes a design flaw,” or “because the designer liked it,” or “I have no clue why it's here,” then it is probably a kludge. What about kludges in abstract games? A kludge is less obvious because the game doesn’t represent anything (other than “a game”). Abstracts are collections of mechanics, different from a model where the context should help people play the game, and the mechanics are expected to represent something that happens in a real world. Nonetheless, in abstracts you can have a mechanic that doesn't fit with the rest, that doesn't mix well or doesn't seem to have a useful function, or clearly should've been replaced with something else, or simply should have been removed from the game. Where do kludges come from? Often they are added to games to solve a problem that appeared in testing. Or perhaps the designer realized it would be a problem, and added it before the testing. Most of the time it's added to fix a demonstrated flaw, but at other times, it's in the game because the designer liked it, even though it doesn't fit with what he ended up with. (Remember, games often end up some “distance” from where the designer originally intended.) He or she isn't willing to take it out, isn't willing to “shoot their baby”. It could be the original idea itself, yet the game has developed in another direction. At that point, the designer should shoot the original, get it out of there, but it's emotionally hard for a designer to do. Now some examples. These are from well-known, successful games, so that you’ll be able to relate to what I’m explaining. Games can succeed despite kludges; but the more you have, the less likely that the game will be good. Catan, which used to be known as Settlers of Catan: both the robber and the monopoly cards. Keep in mind there’s not a lot of interaction in Catan between the players except for the trading, and there's little you can do to actually hinder another player after the initial setup. I think the designer saw the difficulty of hindrance, and decided to add the Robber, which has *nothing* to do with the rest of the game. It doesn't fit at all in any way, shape, or form, but was added to provide a way for a player to hinder another player or at least have the potential to hinder other players. It has nothing to do with the settling model. If it represented mere bandits, a player’s soldiers would be able to do something about it, nor do bandits affect a budding newly-settled region the way they can an old, over-populated region. Catan is supposed to be a game about trading, but I've seen many players who don't trade much. The monopoly card takes all of a particular resource from all the other players and puts them into the hand of the player who played the monopoly card. Then others are forced to trade if they want to get that resource, or wait a long time for more of that resource to be produced. Perhaps someone can come up with an explanation (not excuse) of how this would happen in the real world, I cannot. I think the designer added that card to make people trade, thinking of the groups where there's otherwise not much trading. Catan is very popular and is a decent design that was in the right place at the right time, although technically speaking it has these kludges. How about Risk, the US pre-2008 version, not the newer version based on missions? Some of those earlier versions had mission cards, but they didn't work well. In 2008 Risk was revised with missions to make it quite a different game. In old Risk, the territory cards are kludges in two senses. First, they were an artificial method, and by artificial I mean there's no correspondence with reality, of encouraging players to attack. You have to a conquer a territory to get a card; it was something to try to discourage turtling, which is nonetheless quite common in Risk. Second, you turn in the cards for armies. That's there to bring the game to a conclusion, because you have an increasing number of armies that can get very large. The game is pretty long as is, but it's very long without increasing numbers of armies, which I have played a number of times. Instead of going up to 50 armies and more I used 4-6-8-4-6-8-4-6-8, but that makes it a very long game. Two kludges to solve (or at least mitigate) a fundamental problem in the game: the game didn't naturally come to a conclusion. The game didn't naturally encourage people to attack. So the cards were added for those purposes. Let’s consider the online video games World of Tanks and World of Warships. In big video games like these both harmony and the kludge become obscured. We could probably say that it's easier to make a harmonious game that's relatively small and focused rather than one quite big. In World of Tanks the entire idea of 15 versus 15 randomly assigned teams is a kludge, in the sense that it has nothing to do with real warfare, but it's necessary to make the online game practical for a very large audience. In World of Warships the overall kludge is to play in a small area, usually amongst lots of islands, places where real world battleships and aircraft carriers virtually never went. In both games we have the bizarre mix of nationalities of equipment: German and French and English and Russian tanks or ships on the same side, and possibly 15 different tanks or 12 different ships on a team. It's also a necessary kludge but has nothing to do with reality. So both games break down as models of reality, and the kludges are obvious. But in video games there are many conventions, normal modes of design, that are ridiculous kludges but necessary to make a game of it. (Consider the ammo and medpacks sitting all over the place in shooters, or even respawning itself - awful kludges.) When is a kludge no longer a kludge? When almost everyone accepts it as necessary, I guess. Let's take a tabletop game such as Eclipse, which is ostensibly a Euro-fied 4X space game. It's almost a wargame, almost an exploration game, almost this, almost that, but ultimately unsatisfactory (for me). The major kludge in the game is that players are awarded hidden-value victory points for fighting, and fighting early on tends to give you higher value points because you draw a number of VP pieces and throw some back into the supply. You’re encouraged to fight repeatedly as you can draw again whenever you fight. I think this was added when the rest of the game resulted in little fighting, because people didn't gain enough from fighting. What they were likely to lose in assets was more than they were willing to risk for the possible gain. So the victory points were added well. Rewards for fighting make no sense in the 4X model, or any reasonable model. Your surviving units gain experience when you fight, yes, but you lose a lot of ships and people, and that experience in the overall context should not be worth a lot (if any) of victory points. Military forces are a means to an end, not an end in itself. In a game I watched, about half of the overall points for five of the six players came from fighting, which is ridiculous. They were roughly equal to the points for holding the solar systems that had been discovered. In the long run what do you think is more important? Wars are economic, after all. There are other flaws in the game. For example, the results of exploration are that space is mostly impassable. I think that's deliberate, to avoid and out-and-out wargame, but it doesn't fit one's idea of space as wide-open territory. That makes the extermination part of 4X (Explore, Expand, Exploit, Exterminate) ineffective even with the fighting points. Again, how do you recognize a kludge? I’d say it's easier to find things you think are kludges in a game you don't like than ones you do like. Also we have the limitation that some designers of puzzle-like games, whether they’re single player video games or solo tabletop games or cooperative games, tend to add things to make the puzzle solution more difficult. I come in heavily on the side of this motto: “A designer knows he has achieved perfection not when there is nothing left to add, but when there is nothing left to take away.” I think that’s an alternative definition of harmony. Given that motto, I see many of those puzzle-maker additions as kludges. This is not something you can rigidly define or easily pin down, it requires self-critical thinking. It doesn’t matter what specific mechanics you use, whether already very popular or brand new (the latter very rare). What matters is how they work together as a whole. Designers need to recognize the in-harmonious, and excise it! 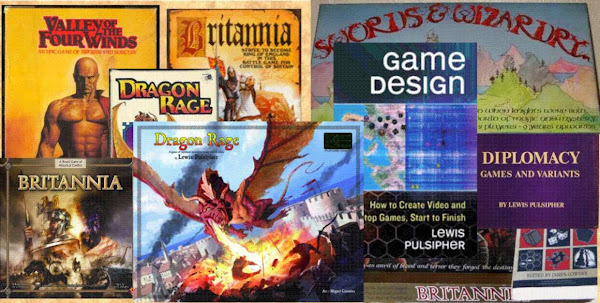 What do I wish I'd been told when I started designing games? I was asked this question in an interview. It doesn't much apply to me, I started more than 50 years ago, but I describe the advice I'd give people starting out today. Drafting (almost always, card drafting) is a common technique in games involving more than one side. The mechanic gives players a greater feeling of control, but takes time. Foolish saying: "You get what you pay for"
"Conventional wisdom" sometimes isn't at all wise. Especially in games, but really in all facets of life, the saying "you get what you pay for" is foolish. Game designers (tabletop or video) should understand elementary math, statistics, probability. So many people don't understand that "average" can have different meanings, that I've described the differences here. Is game design about software? Heck no! Many schools, colleges, universities, whether deliberately or accidentally, equate “game design” with “game development”. The first is about how the game is supposed to work; the second is about creating game software. Why deliberately confuse the two? Why $200 for passing Go? Why there's the $200 reward in Monopoly for passing Go. The $200 income increases the amount of money in play, in an otherwise virtually static economy (really a negative economy, since prices paid for properties and improvements go out of play). Whether that increases or decreases game length is uncertain. Properties have variable pricing (via auctions and inter-player interaction), but houses and hotels do not. A lack of additional funds might lead to “nibbling forever”, players collecting and paying small rents because none had enough money to buy many houses, and so no one would go bankrupt. Only playtesting could tell us whether the game would be longer or shorter without the reward; I’d bet on longer. I'm apparently in a minority who believe that quality of components does not matter provided a minimum standard is met. Chess is the same game whether you use a $100 set or a $5 set. I may also be in a minority in thinking that particular design elements such as "no player elimination" are closely related to generational preferences rather than to any absolute standard of "game goodness", and consequently you cannot identify a great game by the nature of its individual design elements. To make an analogy, a movie that is slickly professional may still be a poor movie, nor is slick professionalism a requirement for a movie to ultimately be judged as great. Notice that formal reviewers often talk about a game's worth in terms of what's in the box. Isn't the gameplay far more important? If it's a dud game, does it matter if it has attractive bits? Or is that a fall-back against disappointment with the gameplay? But the writer says nothing about gameplay. Seriously, I should buy a game for the contents? I thought we PLAYED games, not just looked at them. Or maybe nowadays, some people do buy them just to look at them . . . Idle thought. I tried to characterize the colors in Britannia (second edition) to match real-world styles of warfare. Red - American: obvious, "in your face", smash 'em. Overwhelm at the point of attack. Pre-WW II Germans thought the American army followed the style of American football of the time, roughly “four yards and a cloud of dust” in the T formation. Passing? Nah. Blue - strategy of indirect approach (English), nibbling, just enough force for the job, requiring a "delicate hand"
Green - patient defense, almost guerrilla warfare, until ready to attack. Chinese? Yellow - conquest followed by recession and watchful care. 15th-16th century Spanish? 17th-18th century Russian?